Each Government job employee and most of the private company employee provided fund (PF) amount is deposited in his account. Today we have to discuss a quick and easy to use guide which helps you to check EPF Balance on Android phone. All we know PF amount is deducted from each month salary. Most of the person have to face lot of problem to check EPF balance. Most of the person does not have proper information to check EPF balance. They want to know how much PF amount is deposited in his account and how much contribution is given by the employer. With the help of m-epf app you can easily view your month wise Employee and Employers contribution and total PF amount. Before this app you have to check your EPF balance on Computer or Laptop. But after launching this m-epf app you can easily check or print your EPF balance and different details on your Android phone. You just have to take few given easy steps which helps you to check EPF balance on Android phone. The m-epf app allows you to check PF information for any member, pensioner or employer. All given three category helps you to easily check the PF information account status. Member: This option is used only for a Government or Private company employee. This option not only allows you to activate your UAN number but also view your PF account detail also. You have to fill 12 digit UAN number along with registered mobile number to view the detail. Pensioner: This option is useful for any retired person or pensioner. They have to put PPO number and Date of birth in (ddMMyyyy) format and tap on the submit detail to view the information. Employer: This option is useful for an employer. If any employer contribute PF amount in his employee and want to view the information then he has to tap on the “TRRN Status” button. After filling 13 digits TRRN number tap on the show status button to get the required information. If you are a member and want to check EPF Balance on Android phone then you have to take few given steps. Step 1: Download and install epf app from Google Play Store. 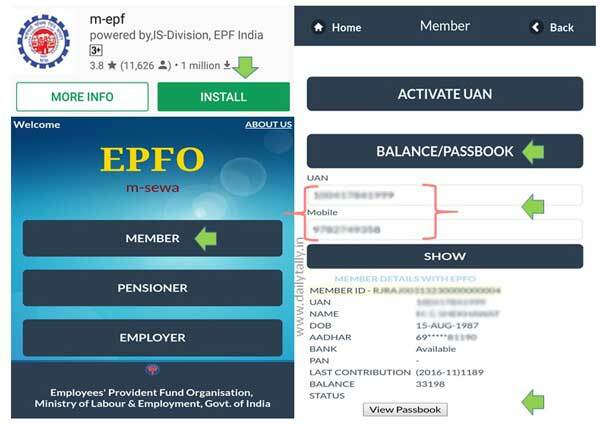 Step 2: Open m-epf app on your Smartphone and you will get three options Member, Pensioner & Employer. Any registered member can easily view his epf account balance with the help of Member option. If any member UAN number is not activated then tap on the “Activate UAN” number button and fill required information. If your UAN number already activated then you can view balance of your epf account with the help of “Balance/Passbook” option. Step 3: Fill 12 digit UAN number and your registered mobile number and tap on the “Show” button. After pressing show button you will get your UAN number Name and other information. Step 4: If you want to view the passbook of your epf account then tap on the “View Passbook” button. You can view transaction, particulars, employee and employer share detail in columnar format. I hope this guide is useful for all those guys who are facing problem to check EPF Balance. 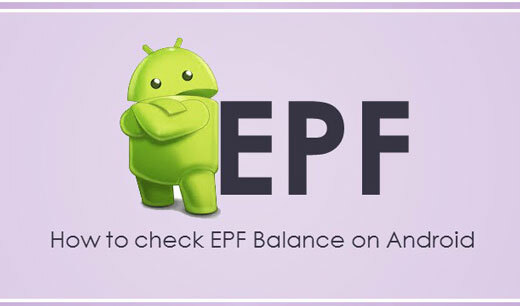 Now after reading this guide you can easily check EPF Balance on Android phone. If you have any query or suggestion about this guide then please write us in the comment box. Thanks to all.